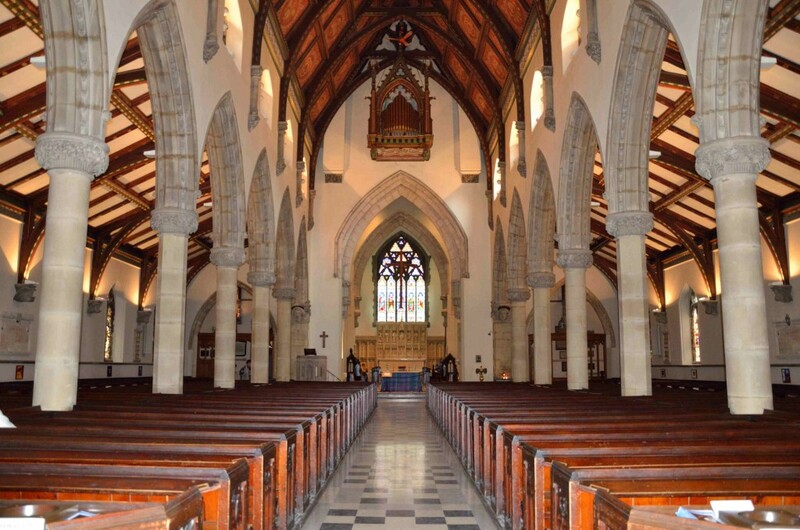 Christ Church Cathedral, as is common with Gothic churches, was built in the form of a cross. 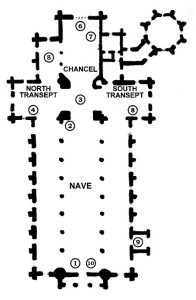 Typically, the nave of a Gothic church runs from east to west. 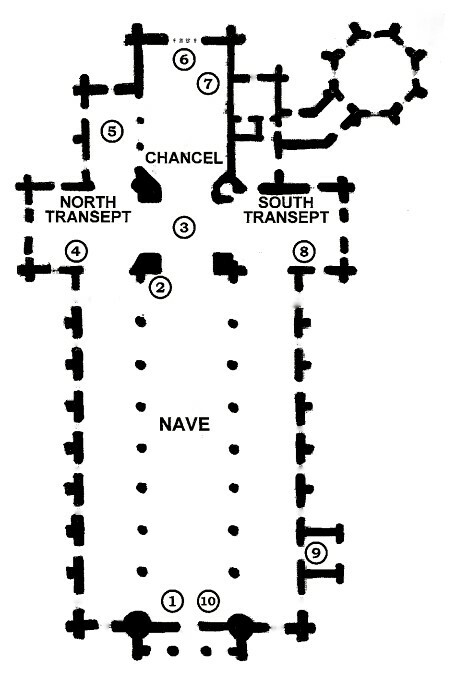 The Cathedral’s site, however, did not allow for this, so the nave runs in more of a north – south direction. 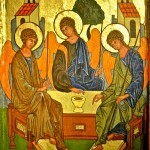 Despite this, the ecclesiastical terminology is still used for traditional purposes. This tour begins at the WEST DOOR, which is the main entrance to the Cathedral. The interior of the Cathedral is celebrated for its successful combination of English and local Canadian design features. The Gothic arches and pillars are crowned with carvings of the diverse foliage found on Mount Royal at the time of construction. 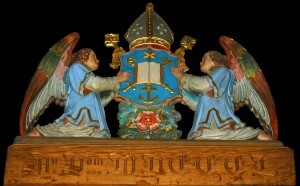 The many carved angels are a unique feature of the Cathedral. Bishop Fulford allegedly insisted on them during construction as a means of emphasizing the company of heaven during worship. 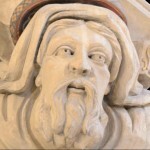 At the four corners of the nave are sculptured heads representing the four Evangelists. On the wall behind the pulpit hangs the COVENTRY CROSS, presented to the Cathedral in 1953 by the Provost of Coventry Cathedral in England. It is made of nails taken from the ruins of Old Coventry Cathedral, destroyed in World War II. Similar crosses were presented by Coventry to cathedrals all over the Communion. The centre of the chancel lies directly beneath the Cathedral’s SPIRE and BELL TOWER. This area is called the ‘crossing’ (3). The NAVE ALTAR is used for the celebrations of the Eucharist. The north transept (to the left of the chancel). The CHAPEL OF ST. JOHN OF JERUSALEM (4) was a gift from the family of Lieut.-Colonel Herbert Molson in 1940 to commemorate his interest in St. John’s Ambulance and St. Michael the Archangel, the protector of hospital work. The chapel has an atmosphere of contemplation and reverence that is closely linked to the Order’s maxims, Pro Fide (for the faith) and Pro Utilitate Hominum (in the service of humankind). This is the only chapel of the Order in Canada and the banners hang above the chapel . The MEDITATION CHAPEL (5) was created in 1980 when the new organ loft was built thereby freeing up the space from the mechanisms of the old organ. In addition to being a designated private prayer space, it also houses the Reserved Sacrament (consecrated bread and wine). 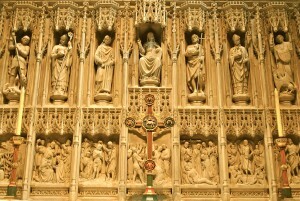 The EAST END ALTAR and its REREDOS (6), located at the end of the chancel, are the architectural focal point of the Cathedral. 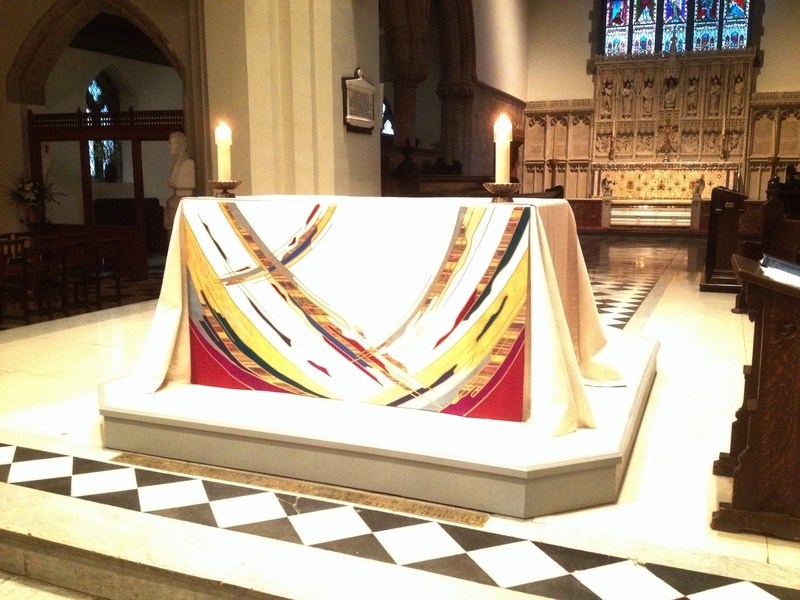 The altar frontal, worked by Ms. M.E. 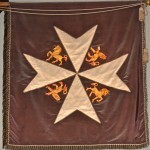 Evans, is a classic example of English church embroidery and contains traditional motifs including Quebec’s fleur-de-lys. The reredos (ornamental screen above the altar) was dedicated in 1923 as a World War I memorial. It took almost two years to complete and is considered one of the most beautiful works of its kind in Canada. Depicted on the stone screen are several important sacred events and figures including St. Martin of Tours, St. Lawrence, and St. John the Baptist. The BISHOP’S THRONE (7), or cathedra, is located on the south wall of the chancel. Cathedra is the Latin word for chair and is the origin of the term cathedral as it is in a cathedral that the bishop’s official cathedra is placed. The textile lining the back of this bishop’s throne is made of material used to decorate Westminster Abbey for the coronation of King George VI. 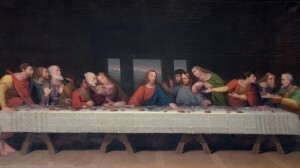 On the south wall above the stalls hangs an eighteenth century Canadian rendition of Leonardo Da Vinci’s The Last Supper which was rescued from the burning old cathedral by a member of the 39th Regiment who allegedly used his sword to free it from the frame. 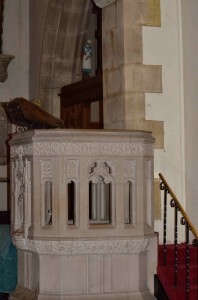 The BAPTISTRY (8), in the south transept, is where both children and adults are baptised and become members of the Christian community. The screen at the entrance was erected in memory of Mr.and Mrs. William S. Kerry and its symbolic carvings indicate English and Scottish associations. Along the southern wall is the CHILDREN’S CHAPEL (9). It was given in memory of The Rev’d Canon E.I. Rexford in 1938. In 1983 the tapestry by Eastern Townships artist Ottilie Fodor was installed over the doorway. 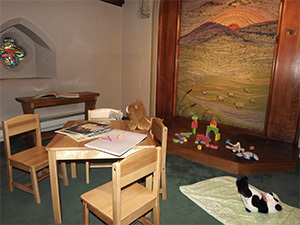 The chapel is now used as a quiet play area for children during services. The CHOIR AND ORGAN LOFT (10) was built in 1980 to house Karl Wilhelm’s new 3-manual, 42-stop, 63-rank, 2778-pipe organ, which replaced an electro-pneumatic organ that was previously in the chancel. Only the former façade of the celeste division, located high on the chancel arch, was preserved. 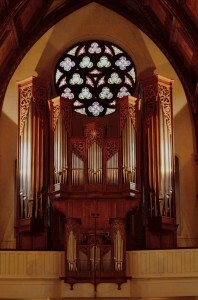 The organ was designed in a North German baroque style. While the style was baroque, the tonal structure was designed to allow for more musical versatility. 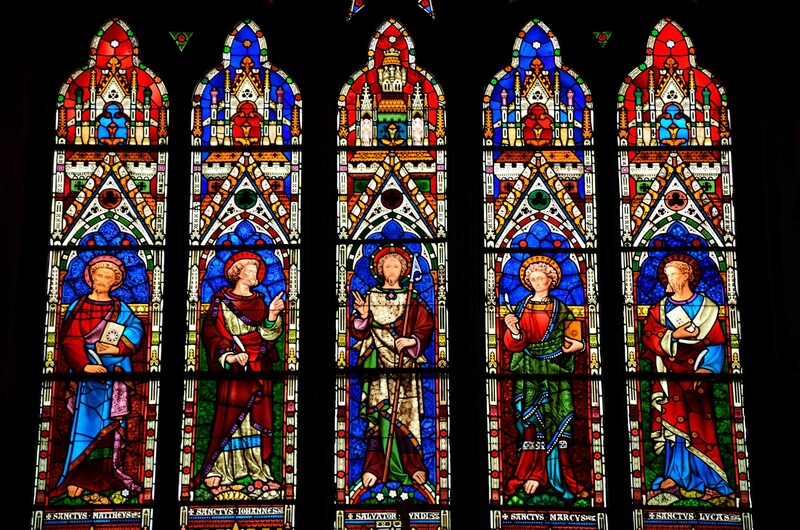 STAINED GLASS WINDOWS are a common embellishment of Anglican churches as they represent the central acts and figures of the Christian faith. Each colour has a specific meaning and plays a pivotal role in depicting the story. 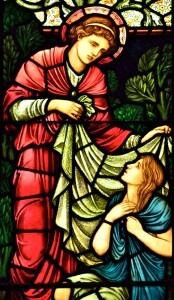 Red, one of the most prominent colours of stained glass, represents the fire of the Holy Spirit, courage, self-sacrifice, and the passion of Jesus. Blue, often considered the perfect foil for red, is the light of heaven. It is also a symbol of profound meditation, of enduring loyalty and eternity, and is the colour of the Blessed Virgin Mary. Gold, green, white, and violet also all have specific meanings that are used strategically in order to accurately illustrate biblical events. 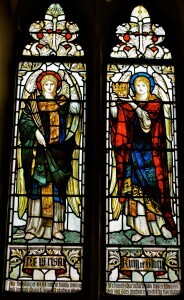 Christ Church Cathedral’s collection of stained glass encompasses several different artistic styles including the renowned work of William Morris and Company. 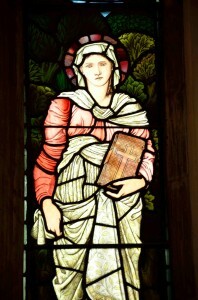 The elements of medieval revival seen in Morris’s work, as well as in his colleague Burne-Jones’s work, went hand in hand with the revival of gothic architecture that was occurring in the mid-nineteenth century. 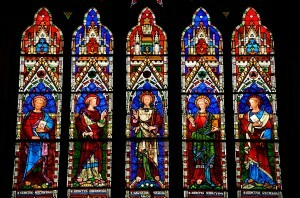 Features of the Cathedral’s windows that are particular to Morris’s style are the detailed use of foliage and the pre-Raphaelite technique used for the figures.